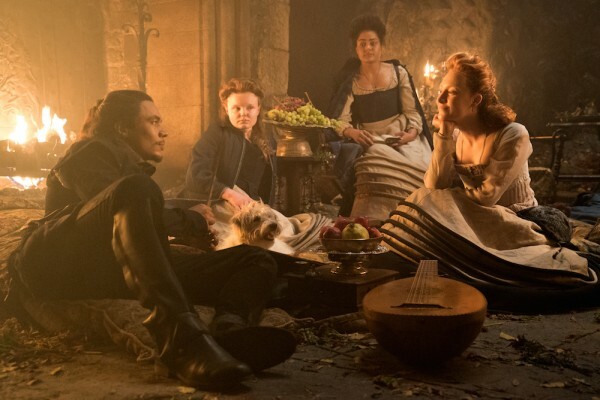 In this treatment of the popular topic of Mary Stuart and her rivalry with Elizabeth I, the theater director Josie Rourke, in her screen debut, gets lost in trendiness and attractive visuals. The rugged Scottish landscapes are beautiful. So is the hair, impressive for both men and women, the latter graced with grand bursting topknots of intricately braided russet locks. I'll remember those glowing knotted locks and the horses' long flowing tails. I'll remember Saorse Ronan's lean, earnest face. Not much else. 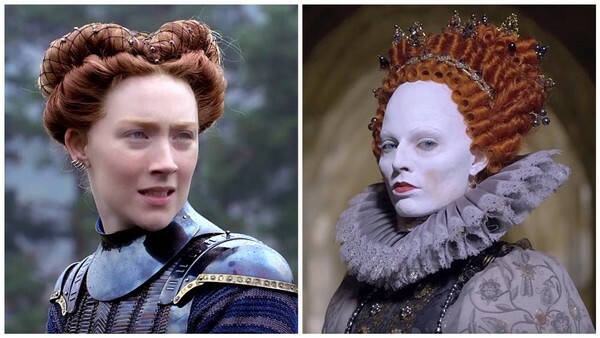 The two Oscar nominees, Margaret Robbie as Elizabeth I and Saorse Ronan as Mary Stuart, do their best in the two main roles, but for all the elaborate drama their characters flounder in a narrative reduced to a story of two rival celebrities who, in real life, never even met, while the main one, Mary, gets her head chopped off, an event that bookends the film and is shown right at the start. This story anchored in major real events seems bolstered up constantly in House of Cards writer Beau Willimon's adaptation from historian John Guy's book by the stretched, invented, or implausible, and yet his inventions don't flow or have the crude panache of Yorgos Lanthimos' admired recent historical fantasy, The Favourite. Willimon remedies the lack of actual encounters between the principals, as several previous films have done, by inventing one. It takes place fleetingly, amid gossamer curtains where they compliment each other. This seems unlikely even as a fantasy. Elizabeth is full of envy and admiration toward Mary, her beauty, her progeny. (She has a son, an heir, who will become James VI and I.) There is not even a hint that after holding her prisoner for eighteen years, Elizabeth will have Mary executed. But each man kills the thing he loves. And we do have the warning in Mary's insistence that she should also be queen of England. They are cousins but sworn enemies, since Mary is Catholic, Elizabeth Protestant. Elizabeth, the long-reigning Virgin Queen, the symbol of the English Renaissance, is well-played by Margaret Robbie, but she has much less screen-time and has little to work with. She comes off as ill (from a case of small pox), fearful, disfigured, envious, and manipulated by her adviser William Cecil played by Guy Pearce. She declares herself in the end to have sacrificed all to ruling as a man: not such a bad job, though. Saorse Ronan's Mary looks stripped-down, brave, a Joan of Arc type, but this is not one of her best roles and she seems a little wooden. Rourke makes her cast very multicultural, including Asian, black, and Hispanic actors, an ahistorical sort of gesture that might look spirited and up to date on the stage, but is jarring on screen in elaborate realistic backgrounds. People, even royals, seem also to sit around on the ground a lot, for some reason. These are liberties Derek Jarman could have got away with. And he would have done well with other things too,made Elizabeth's meetings with Cecil more intimate and special, dramatized Mary's isolation and desperation more interestingly. He'd have been at home, but more subtle, with the writer's invented sexual fantasy in which Mary marries Henry Stuart, Lord Darnley mainly because he gives her a good blow-job. He's her cousin, but the movie doesn't mention that. Mary also has a favorite, a young Italian musician, David Rizzio (Ismael Cruz Cordova ) whom she and her three ladies-in-waiting play with. These ladies have come over with her, a teenager, at the outset when she arrives from France, speaking French in alternation with an implausibly heavy Scottish brogue, after the death of her husband Francis II following a mere one-year reign. The musician is gay and likes to dress up as a woman, which the ladies freely indulge - this is part of the multiculturalism. And he gets it on with her husband. There are only hints of this in history, but what there is a clear account of, which we see, is his murder by stabbing, death by many cuts, because Mary had made him her adviser and an adulterous relationship was suspected. All that goes on mostly inside, in the stark but magnificent Holyrood Palace. Outside is the crudely stereotpyed protestant leader John Knox (Scottish star David Tennant, buried in long beard and funny hat), who whenever seen preaches against the Catholic queen. It all seems a little crude, and somehow doesn't add up to a full picture or a historically convincing one. But it is saved, momentarily at intervals by the horses, the landscapes, and the hair. This is a very pretty film, in a conventional but unmistakable way. But looks aren't enough to make it hang together or justify the long, meandering run-time. Mary Queen of Scotts, 124 mins., debuted 15 Nov. 2018 at AFI Fest, showing in a few other festivals before 7 Dec. limited release, and 21 Dec. wider release in the US. Screened for this review at Landmark Albany Twin Cinema, 21 Dec. Metascore 61. Last edited by Chris Knipp; 12-22-2018 at 05:52 PM.